Brian Williams at the 2011 Time 100 gala. 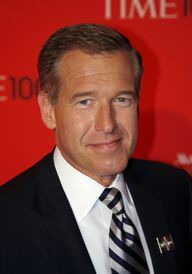 Birthplace: Ridgewood, New Jersey, U.S.
Brian Williams is an American journalist and news anchor. Brian Williams has reported in cities including New York and Washington D.C. He became an anchor for NBC Nightly News in 2004. His coverage of the Hurricane Katrina disaster was well received. Williams is currently an anchor for MSNBC. Williams has won several awards for his work, including two Emmy Awards. Williams has been involved with several incidents that involve controversy. During the Iraq War, Williams made statements about his helicopter being attacked that were found to not be entirely true. He also supposedly lied about flying to Baghdad with Seal Team Six. Brian Williams is a famous American journalist, who was born on May 5, 1959. As a person born on this date, Brian Williams is listed in our database as the 7th most popular celebrity for the day (May 5) and the 14th most popular for the year (1959). People born on May 5 fall under the Zodiac sign of Taurus, the Bull. Brian Williams is the 176th most popular Taurus. Aside from information specific to Brian Williams' birthday, Brian Williams is the 1141st most famous American and ranks 6th in famous people born in Ridgewood, New Jersey, U.S. In general, Brian Williams ranks as the 1966th most popular famous person, and the 13th most popular journalist of all time. “The Famous Birthdays” catalogs over 25,000 famous people, everyone from actors to singers to scientists to serial killers and more. If you're curious to see who was born on your birthday, you can use our database to find out who, what, where, when and why. You can search by birthday, birthplace, claim to fame or any other information by typing in the search box, or simply browse our site by selecting the month, the day, the horoscope, or any other clickable option. 6th born in Ridgewood, New Jersey, U.S.